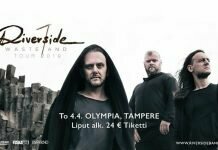 The Finnish rock clubs have seen a lot of sweaty hair and dandruff since the last time the Polish death metal legends, Vader, played indoors in our country. We’ve experienced a couple of festival gigs over the years at Steelfest and Jalometalli, but Vader’s last club show took place 9 years ago. Quite the combination was announced earlier this year, as Vader and their countrymen, Decapitated, were told to visit Finland and play a total of three shows as a part of their Crushing the North 2017 tour. Decapitated has never done a show in Finland, so this was a must-see event – The Negation (2004) and Organic Hallucinosis (2006) were some of my teenage years’ favorites, and the strong comeback record, Carnival is Forever (2011), released after the tragedy that struck the band a few years before, has also garnered a lot of playtime. Based on the comments on the event’s Facebook page, the shows in Seinäjoki and Tampere had been killer performances, so I headed to Nosturi with anticipation on the sunny Tuesday night. Was Pekka Pouta going to be in the moshpit again? We had to find out! The ticket price of 30€ had a nice bang for the buck ratio to it, as in addition to Vader and Decapitated, the line-up consisted of the Polish death metal squad Thy Disease, Swedish Nox Vorago, and Thrashred from Russia. Because of the weekday date, the showtimes were packed tight, leaving Thrashred to kick things off already at 19:00. The Russians got to do their set in front of only a handful of curious attendees, but for a band that was formed only a few years ago and has so far released only one demo tape, their thrashy 25 minutes were fairly decent. If I had to find a comparison, I’d say that their stuff reminded me of our own Profane Omen, just less death-y and more thrashy. For some reason, Thrashred’s stage sound was downright horrible, with the solo guitar burying everything else; it almost sounded like nobody had turned any knobs from their default position during the soundcheck. All-in-all, if one didn’t pay attention to the sounds, Thrashred offered a nice start, and once they get to release more material, I can imagine a bit more attention heading their way. The intermission after Thrashred was quite short, enabling Nox Vorago to take the stage not 15 minutes later. Dressed in black robes and copper-colored masks almost reminiscent of the Scream movies, the Swedes had to play their four-song symphonic death metal set with similarly abysmal sound as their predecessors. During the set, I noticed that half of Nosturi’s mix table had been covered with no one to touch any knobs – was this some kind of ridiculous demand from Vader? No one can pay attention to a show that just sounds like distorted guitar noise! The mix even created a few voids during the first few songs, as the band’s backing track wasn’t quite loud enough. The sounds aside, Nox Vorago, being completely unfamiliar to me beforehand, managed to convince. Their songs contained a good deal of variance, as full-fledged blast-beat passages were used only to spice things up between more symphonic parts. I also liked vocalist Uduun’s coarse shouting voice, as it was refreshingly different than what you might be accustomed to within their genre. The players were pretty uncommunicative behind their masks, but the lights brought the desired action to the show. The crowd in front of the stage grew significantly larger during Nox Vorago’s set, and the audience seemed to like them – if bands like SepticFlesh or Whorion are your cup of tea, Nox Vorago is definitely worth checking out. Before Decapitated, it was time for the evening’s third Polish act, Thy Disease, to take the stage. The band has admirably managed to keep themselves under the radar – they’re 18 years in the running and I don’t recall even hearing of them before now. Having started off as a death metal act, but shifting towards a more industrial sound later on, Thy Disease’s set was an entertaining 30 minutes of modern metal, but as the mixing booth was still untouched, one couldn’t enjoy this one any more than the two previous shows. The backing tracks were on point, though – the synthesizer loops programmed by Yanuary, the guitarist and only founding member left in the band, whirred and clanked like crazy behind the band instruments. If you’ve heard earlier work from the Russian Grenouer, Thy Disease might interest you. Vocalist Syrus was a sympathetic character in his Gothic pants, scraggly beard, and grown-after-the-latest-promo-shoots hairdo, but also a charismatic performer – even his microphone cable matched the red accent color of his pants. I would’ve allowed a bit more time for these guys, as their set ended almost surprisingly soon; I got to watch a couple of songs with complete attention, after which I ran into a couple of my friends, and suddenly the show was over. The front of the stage had filled during Thy Disease’s show, and once the curtains were pulled aside after the 20-minute intermission, the whole of Nosturi cheered as Decapitated got on stage. The audience were given no quarter as the band kicked things off with “The Blasphemous Psalm to the Dummy God Creation” and the title track from their latest album, Blood Mantra. I was on the upper balcony as the show started, but had to relocate as the intensity downstairs was something I didn’t want to miss. 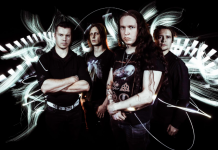 Before their latest single, “Never”, vocalist Rafał Piotrowski commended the audience on the warm welcome and that it’s great to finally get to play in Finland. One hears stuff like this all the time during metal shows, but it’s always great to hear them from one of your favorite bands! Things continued on with the almost best possible way, as after “Never”, Decapitated jumped to Organic Hallucinosis and played “Day 69” and “Post(?) Organic”, the former being one of my all-time favorites. The time travel went on all the way to Nihility (2002) with “Spheres of Madness.” The remainder of the set continued with more recent tracks, and the second-to-last song, “Homo Sum” from Carnival is Forever, was a clear high point in the show. The last song was Blood Mantra’s “Nest”, after which the feeling was confused – was it over already? Where are all the rest of their killer songs? Decapitated is just killing it these days, and it’s astounding to see the guitarist and only original member, Vogg, enjoy performing – the horrible tour bus accident 10 years ago killed his brother (and the band’s drummer) Vitek and put the vocalist Covan in a coma. Fortunately, after 2 years of mourning, Vogg decided to continue with the band, and it wasn’t in vain, as the band was on fire this night and the moshpits raged on in the audience. An excellent show from a band that has gone through a lot! I hope that the new Anticult record, set to be released in July, will mark Decapitated’s return to Finland, as there are still a lot of songs to hear. After Decapitated, I was starting to feel a bit worn out, but the show had to go on; Vader is a true death metal legend, boasting a career of twelve full-lengths and a pile of EPs and compilations on top of that. My personal favorites span the previous decade with the amazing Impressions in Blood (2006) up front, but don’t get me wrong – despite the length of their discography, Vader cannot in any way be blamed for inconsistency. A moment before 22:30, Piotr “Peter” Wiwczarek and co. took the stage and started on full throttle with “Wings” off Litany (2000). It’d been 8 years since the last Vader show I’d seen, but Wiwczarek hadn’t aged a bit. I don’t know Vader’s material well enough to regurgitate the whole setlist, but as a whole, the set was constructed traditionally with tracks from their latest album and from the old classic records. Their latest output, The Empire, from last year, was featured with a bunch of tracks; Tibi Et Igni with a couple ones; and the rest of the choices were from The Ultimate Incantation, De Profundis, and Black to the Blind. For example, the already mentioned Impressions in Blood was completely left out, but as Vader dropped one incredible song after another, I didn’t have time to be bummed. Classic songs like “Sothis” and “Carnal” still defend their place in the set, and The Empire’s more mid-tempo assaults brought welcomed breather moments between faster tracks. The band itself was solid as ever – Wiwczarek played his almost Kerry King-esque shredding solos effortlessly as usual, Marek “Spider” Pająk and Tomasz “Hal” Halicki, both having joined Vader in the beginning of the decade, handled the rest of the stringed instrument section nicely, and the British drummer, James Stewart, didn’t pale one bit when compared to his predecessors like Doc or Daray. Regarding stage presence though, Vader’s frontman has always been and will always remain Wiwczarek – the man has admirably dedicated himself to Vader for over 30 years now. After “Black to the Blind”, the final song in the set, I was so tired that I had to leave my last beer behind half-full, but what a show it was! The Polish have always seemed to know how to nail these things; the only complaints I have are related to the unfair performance conditions of the warm-up acts. A big thank you goes out to the organizers, and judging from the number of people leaving the venue with smiles on their faces, I’d suspect that dragging the mid-Europeans back to play metal in the far north had also been profitable. Next articleBATUSHKA Turussa Keikalla 03.06.2017!